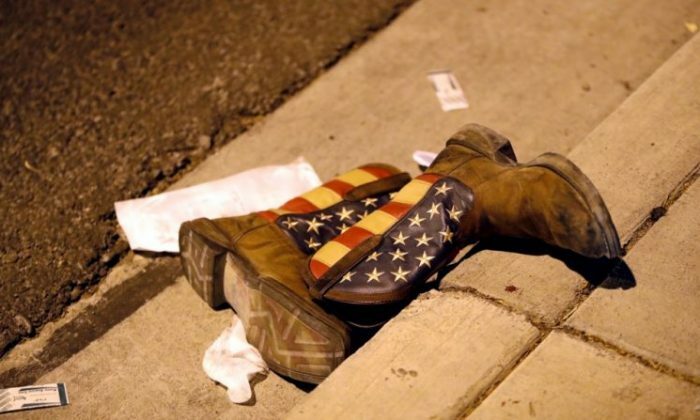 The man who wore the boots that became the subject of a powerful photograph in the aftermath of the Las Vegas massacre was shot in the leg during the carnage. Stephen Vicelja went to the Route 91 Harvest Festival with friends wearing his cowboy boots emblazoned with the American flag. When the first shots rang out, he thought fireworks were going off. But then he was shot in the leg. “I’m hit, run… and I just took off and started running,” Vicelja told CBS. When Vicelja made it out of the venue a stranger pulled his boots off to help bandage him up. Vicelja, who is now back from the hospital, spotted a picture of his boots on social media. The picture was taken by a photographer for the Las Vegas Sun and has since gone viral. In the image, the stars-and-stripes boots are seen lying amid bandage wrappers left behind by the kind stranger who helped Vicelja. “It was pretty amazing to see how many people were helping all those people sitting on the curb,” Vicelja said. Now he wants to get the boots back. They’ve become a symbol of his survival and a reminder of those who lost their lives, including his South Torrance High classmate Christiana Duarte. “We were all kind of praying for her and hoping she got found but we heard the worst news,” Vicelja said. Vicelja is also keeping his blood-spattered concert wristband. Vicelja was limping, but okay and was expected to see a doctor to determine if more shrapnel should be removed from his leg, according to CBS. Investigators probing the mass shooting at a Las Vegas concert planned to interview the gunman’s girlfriend on Wednesday, Oct. 4, a day after she returned to the United States from the Philippines. Her relatives told media she had not known of his plan. Stephen Paddock, a 64-year-old retiree, killed himself moments before police stormed the hotel suite from which he unleashed Sunday night’s attack. Paddock, who killed 58 people in the deadliest mass shooting in modern U.S. history, left no clear clues as to his motive. Law enforcement authorities were hoping to obtain some answers from the woman identified as Paddock’s live-in companion, Marilou Danley. Clark County Sheriff Joseph Lombardo called her a “person of interest” in the investigation. Danley, an Australian citizen reported to have been born in the Philippines, landed in Los Angeles on Tuesday night after taking a flight from Manila, where she had traveled to before the shooting rampage. A police official in Manila, the Philippine capital, and a law enforcement official in the United States, both speaking on condition of anonymity, said Federal Bureau of Investigation agents were meeting Danley on arrival. The U.S. official said Danley was not under arrest but that the FBI hoped she would consent to be interviewed voluntarily. Danley had assured her family she has a “clean conscience” following Sunday night’s rampage, her brother Reynaldo Bustos told ABC News in the Philippines. Danley’s sisters told Australia’s Seven News that Paddock had bought Danley a ticket to the Philippines, a move they now believe was intended to allow him to plan his attack without interruption. The network did not provide the sisters’ full names. “She probably was even [more] shocked than us because she is more closer to him than us,” one of the sisters told the network. Investigators were examining a $100,000 wire transfer Paddock sent to an account in the Philippines that “appears to have been intended” for Danley, a senior U.S. homeland security official said on Tuesday. The official, who has been briefed regularly on the probe and spoke on condition of anonymity, said investigators’ working assumption was that the money was intended as a form of life insurance payment for Danley. President Donald Trump, who strongly supported gun rights during his White House campaign, was traveling to Las Vegas on a condolence visit on Wednesday. The trip will be the first time that he has faced as president the aftermath of a mass major shooting of the type that have killed hundreds of people in recent years in the United States. In Las Vegas, police said they did not yet know what motivated Paddock, who had no criminal record, no known history of mental illness and no outward signs of social disaffection, political discontent or extremist ideology. Danley had been sharing Paddock’s home in a retirement community in Mesquite, Nevada, about 82 miles northeast of Las Vegas, according to police and public records. She arrived in Manila on Sept. 15, flew to Hong Kong on Sept. 22 and returned in Manila on Sept. 25. She was there until she flew to Los Angeles on Tuesday night, according to a Philippine immigration official. A Philippine police source said authorities in Manila were told Paddock used identification belonging to Danley, who has an Australian passport, when checking into the Mandalay Bay hotel on the Las Vegas Strip. A total of 47 firearms were recovered from Paddock’s hotel suite, his home in Mesquite, and another property associated with him in Reno, Nevada, according to Jill Snyder, special agent for the U.S. Bureau of Alcohol Tobacco and Firearms. Snyder said 12 of the guns found in the hotel room were fitted with bump-stock devices allowing the guns to be fired almost as though they were automatic weapons. The devices are legal under U.S. law, though fully automatic weapons are banned for the most part. More than 500 people were injured, some trampled in the pandemonium in Las Vegas. The death toll far surpassed the massacre of 26 young children and educators in Newtown, Connecticut, in 2012, and the slaying of 49 people at a gay nightclub in Orlando last year. The latter attack was previously the deadliest mass shooting in modern U.S. history.